Warmth and convenience are important for riding gear. Luckily, our men's touchscreen motorcycle gloves have both of those covered. Never fumble with your smartphone again. Stay cool and dry with 100% polyester mesh back of hand. Easy movement is important too, so we’ve given these gloves stretch fourchettes, ergonomic thumb and pre-curved fingers. The hard, molded knuckle protector gives you extra protection, while the touchscreen-compatible index finger makes it easy to use devices. 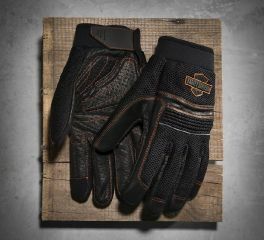 Lightweight mesh and durable leather come together in the Stark Mesh & Leather Gloves. 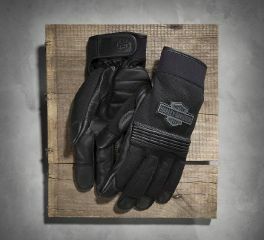 The material combination makes this a versatile pair of full finger gloves to sport throughout the riding season. Touchscreen compatibility and plenty of other features add value and top-quality construction ensures this gear is going to stick with you for the long haul. Combination materials – mesh and leather – are a practical way of giving the Saddle Mesh & Leather gloves versatility in different climates and temps. To minimize shock, we pad this pair of men's full-finger gloves with 4 mm (that's a lot!) of our most vibration-absorbing material.